I listened to last week's Week in Westminster today on the way into work and heard Peter Lilley say something very interesting. It was during a debate with Labour's Patricia Hollis where she was suggesting that David Cameron was mistaken to have ring-fenced benefits for pensioners in the way that he did before the election. Lilley pointed out quite rightly that Cameron ended up doing this as a result of a large amount of pressure applied by Labour who accused him of planning to reduce pensioner age benefits and demanded that he rule it out. Now they are saying he should not have ruled it out. Hollis at this point spluttered incredulously that Cameron should be strong enough to make his own decisions on policy. They are both right. Lilley is spot on in his description of what happened and is correct to highlight the hypocrisy. Labour might not be in office but Conservative policy was not made in a vacuum before the previous election. Cameron was indeed responding to Labour attacks. I think he should not have ruled out pensioner benefit cuts but you can understand why he did. Older people vote in much higher numbers than younger people and with Labour unwilling to allow a sensible debate about it and instead running scare stories about what the "evil Tories" were planning for your granny Cameron's response was predictable. I'm singling out Labour here but all parties do this. The Tories probably prevented Labour from getting a majority in 1992 by running "Tax Bombshell" scare stories. The repercussions of that were felt all through the New Labour years with Blair always refusing to raise income tax (which is partly why our economy is in the mess it is now with so much investment on the never-never). He bore the scars on his back of that election campaign. And I know my own party are not beyond a bit (or even a lot) of opportunistic positioning when it suits, some of which has bitten us hard on the arse now we're in government. I hope we have learned lessons. But sadly as a whole the political class tends to learn the wrong lessons. If we want genuine and lasting reform of things like pensions, the welfare state, the NHS, schools and all sorts of other areas we need better than hypocritical posturing. Sadly I don't think we're going to get sensible debates on any of these issues. Our political system seems to actively militate against it. Maybe it's the inbuilt adversarial nature of it. Maybe it's just too damn easy (as Labour has done for the last two and half years and the Lib Dems used to be famous for) to just oppose everything a government does and claim it would be much better under you. It of course leads to mass disillusionment eventually but hey, at least we got one over on the other lot eh? House of Comments - Episode 45 - Europe - The Final Countdown? Episode 45 of the House of Comments podcast "Europe - The Final Countdown?" was recorded on Sunday and is out today. This week myself and Emma Burnell were joined by UKIP head of press Gawain Towler to discuss Cameron's announcement of an in/out EU referendum in 5 years time, the intemperate comments of Lib Dem MP David Ward about Israel and the blacklisting scandal. Around 10 minutes in for a few minutes the sound goes slightly echoey. We sorted it out after that but apologies. It gets better if you listen on! Mark Ferguson has posted a call to arms on LabourList this morning urging his comrades to stop neglecting their heartlands and proclaiming that there is no such thing as a safe seat. His case-study is Bradford West where George Galloway stormed to victory in last year's by-election partly due to the indifference shown to the constituency by the local Labour Party who had been allowed to get away with this because the seat was perceived as solid red. Mark's argument sounds reasonable but let's consider an analogy. Imagine that you run a team responsible for administering a number of small local shops, let's say 325 of them across the country. You know that 200 of them have turned a consistent solid profit for the last 50 years. You know that for a further 60 of them they have returned a decent profit for 45 of the last 50 years and are very likely to do so again in the next few years. That leaves the remaining 65 stores which have historically been more inconsistent. 30 of them have about a 75% chance of returning a profit but the remaining 35 have a 50% chance of going bust without some significant investment and general corporate TLC. Also, there are another 50 stores currently run by a competitor that you would like to get your hands on but that will involve a lot of investment to acquire them and then keep them going. So as CEO of this company, how do you allocate your resource? It seems pretty obvious to me that the 260 stores that have consistently turned a profit and are very likely to continue to do so should be left largely to their own devices. Sure you might want to send someone round to each of them to say hello, make sure there are no problems looming and tell them how well they're doing but beyond that, spending much more time and money than that would be wasteful and from a corporate perspective rather pointless. Where's the gain? The real focus would be on the 65 stores that are struggling and the attempted takeover of the 50 new stores. That's where the real gains lie in turning around stores that are struggling to make them profitable and adding new stores to the company. Labour are in a very similar position. They have around 260 seats and most of them are likely to be pretty solid. They may want to put some central resource into some of the more marginal ones but really, to try and win a majority they need to focus on the 100 or so target seats that will get them a working majority. If they were to take their central resource and pour loads of it into seats where they already have big majorities, under our electoral system it would be a waste. The money and time is far better spent where it can likely make the difference between a seat won and lost, not a seat that is won with an even bigger majority than last time. Mark is wrong when he says there are no safe seats. Yes there are. And Labour has at least 200 of them. Galloway was a "black swan". Yes, he has hit them twice (in 2005 in Bethnal Green and Bow as Mark rightly points out and in 2012 in Bradford West) but it is very unlikely anyone else is going to be able to do that to Labour in 2015. Even if they could it would be 1 or 2 seats maximum and cannot really be planned for. It still makes far more sense to focus on the marginals and maximise their chances of winning there. Of course this does mean that over time people in the safe seats feel neglected and there is a long term risk that they will get tired of being taken for granted and look elsewhere. This is as true in "true blue" safe Tory seats as it is in safe Labour ones. It is our electoral system that causes this. The safe seats stack up on either side and the main fight is for the 100 or so marginal seats that are up for grabs. The parties are simply responding to the electoral incentives in the same way as our shop manager is responding to the realities of the market. This cannot be changed by "urging" parties to stop taking people for granted. It will only change if the electoral incentives change to make it worth the while of the parties to focus on every single vote. Until that happens calls to arms like this are essentially whistling in the political wind. Is Clegg's problem that he is too honest? We see it time and time again with Nick Clegg. He is asked whether he slept with "no more than 30 women" and agrees with the statement (that could mean anything from 1 to 30) and is pilloried for not being serious about politics. He just answered the question! He apologises for a mistake in pledging before the election to prevent tuition fees going up which in retrospect was an impossible thing to make happen given how many other MPs were elected on a platform where they made no such pledge. He is vilified across the political spectrum and in the media for being weak, inconsistent and duplicitous. He is simply being as honest as he can be. Firstly Nick Ferrari on LBC grilled him on whether he is likely to send his children to private schools. Clegg answered candidly explaining that he hasn't decided yet, that he hopes to be able to send them to a state school if they can find a suitable one and that his wife will be heavily involved in the decision. Cue derision from the left about how he is adding to his woes by answering this question in this way (he should simply use his kids as political pawns as far as I can tell is the argument) and from other quarters about how he is "hiding behind his wife". Never mind the fact that his position is the same as pretty much any father living in London with a household income in his bracket. Secondly in an interview for House magazine he questioned the government's approach to capital spending in its early months and conceded that they could have approached things differently. Cue an avalanche of criticism from the media and Labour. He is merely stating the bleeding obvious. Things have not worked out brilliantly in this area. I would far rather have a politician in office admit where they think there have been problems. It gives me confidence they are likely to change tack in response to events rather than blindly ploughing on. What all these incidents demonstrate is that the constant cry we hear for politicians to "tell the truth" and "give it to us straight" that you hear from media pundits and members of public on phone in shows aren't really true. Clegg is one of the most honest politicians in front line politics today. And yet his very candour is so often used against him. The only conclusion I can draw is that what we really want is to be lied to. With Cameron's EU referendum promise (by 2018) yesterday on a renegotiated EU membership for the UK the "tectonic plates" of British politics have now shifted again. UKIP deserve credit for having contributed, perhaps decisively to Cameron's decision to opt for this plebiscite. It's even more impressive when you consider that they do not even have any MPs. However the announcement could provoke an existential crisis within the new upstart right-wing party. Their main (although by no means only) policy is for an in/out referendum on Europe. It's why the party was formed and is really the only policy that they could honestly say their entire party will coalesce around. Cameron has shot that particular fox. Come 2015, UKIP will have an important decision to make. Should they fight tooth and nail for every seat in the country as a truly national political party would? The risk with this is that it splits the vote on the right and could directly lead to the Tories losing the election. With Miliband already on the record against an EU referendum the effect of that could be to prevent the very referendum they want. Our bizarre electoral system could mean that a substantial vote for UKIP means that ironically we end up further away than ever from a vote on EU membership. So maybe they ease off on the gas a little, especially in Conservative seats. But that is not what a true political party would do. Surely UKIP members, certainly in those blue seats will start to wonder why they are bothering if they are (either tactily or even overtly) asked to rein it in for 2015. Expect a fair bit of leakage back to the Tories of both voters and members if that was to happen threatening UKIP's viability in the longer term. The other possibility is that there is some sort of pact with the Conservatives. I think this is unlikely but if UKIP call their bluff and continue to push hard Cameron may feel he has no choice but to entertain the idea. This would be a disaster for the smaller party. They would effectively be subsumed by the much larger party and whilst they may get a few MPs there will be huge swathes of UKIP supporters all over the country who are denied a chance to vote for a UKIP candidate. Again, not the actions of a party that wants to maintain widespread and popular support. I don't know which way things will go but I know that however they do play out UKIP now face a threat to their very existence. I'm sure this was at least a little bit in Cameron's mind when he made his speech yesterday. As I type David Cameron is delivering a speech on Europe in which he will promise an in/out referendum on Europe after the next election following a renegotiation of terms of membership for the UK. There are lots of comments from across the political spectrum both for and against the PM's move. Many on the left are attacking him as "weak", the argument being he has capitulated to his backbenchers and is running scared of UKIP. There may be some truth in that but politically being on the side of "the voters" and giving them "the choice" is pretty damn hard to argue against. And that is where the danger lies for the Lib Dems. Senior parliamentarians have been active in recent days making it clear that we are not in favour of an EU referendum unless something significant has changed (which technically has been our position since Clegg took over). I have argued previously that our position was too nuanced. We used to be for a referendum (and caveats were often not applied before the election), now we appear to be rowing back. There will be a temptation to try and distance the party from Cameron and fall in with the criticisms of him being "opportunistic". That would be an error and also failing to respond to the suddenly shifted ground. Cameron's speech gives us the chance to get back on track. We should agree with allowing a referendum once terms have been negotiated. That will help to neutralise it as an issue. It's perfectly consistent with our position as we can clearly argue that renegotiated terms are a change and therefore our promise of a referendum should then kick in. This actually gives us a way out of the political cul-de-sac we have got ourselves into on this issue in recent weeks. We should take it and back Cameron. Episode 44 of the House of Comments podcast "The Death of the High Street" was recorded on Sunday and is out today. This week myself and Emma Burnell discuss the future of the economy in the context of the recently announced high street troubles for HMV, Jessops, Blockbuster and before them Comet and others. How will our country and its workforce adjust to the new realities and can the state plan for this future or should we just go with the flow? You won't be surprised to hear that me and Emma have somewhat different views on this! Irrational drugs policies incentivise experimenting with the unknown | City A.M. I wrote a piece last week for Independent Voices in which I argued that in my view Labour will not be able to win a majority in 2015 because of the corner they have painted themselves into on the cuts. Stephen Tall is right on an EU referendum. And also very wrong. Stephen Tall has recently been promoting the fact on Lib Dem Voice that the Lib Dems only ever promised a referendum on membership of the EU when there was a fundamental change in the relationship. Stephen is absolutely right about that. That has been the line since 2007 and it hasn't really changed since then. But he is also wrong. Wrong in that the fact he is right is largely beside the point. "..time for a debate politicians have been too cowardly to hold for 30 years - time for a referendum on the big question. Do we want to be in or out?" "This generation deserves its chance to say where we stand on Europe - in or out." To most people's minds those sort of statements are pretty unequivocal. If we row back from them now we look shifty and like we are the ones who are cowards. Guido and others have been making hay in recent days with Lib Dem leaflets from a few years back that called for a referendum. There were no caveats attached and we were clearly trying to neutralise Europe as an issue in order to win votes from those who might want to vote "out". So whilst on a technicality we might be able to point to the fact that the context was in discussions around the Lisbon treaty and how if there was going to be a referendum on that treaty we'd be better off with it being an in/out referendum. But that won't cut much ice with most people. There are too many on the record Lib Dem statements of how "the people should decide". We look like we are backing away from a referendum. One final point. This referendum is going to happen. It is a racing political certainty. The time has come. As Clegg pointed out in that piece nobody under the age of 51 (now 55) has ever voted on membership of the EU/EEC. If it is inevitable as it is, far better to be on the side of those calling for it from a strong principled position rather than looking like the shifty bunch who called for a referendum a few years back but now are denying that's what they really meant. During any referendum campaign "they never wanted to have this vote in the first place" will form a plank of the "out" campaign. We're giving them unnecessary free ammunition. We've already dug a hole for ourselves here. We need to get out of it and accept we called for a referendum. Not keep wriggling on the hook. We have precious little political capital left. We should not be spending it on this futile exercise. I've read a couple of articles in recent days about how UK mobile phone operators are blocking content such as political satire and LGBT news sites by default. I think the idea is that "mature" content is set to be opt in in order to prevent younger eyes from seeing "adult" things. There is certainly a strong debate to be had about whether you need to be 18 before you can read political satire and information about LGBT issues and I know which side I would come down on. I just wanted however to briefly share my experiences in this area as they may help to shed some light on the approach of the mobile phone ISPs. Over the last 18 months I spent several months in hospital because of a family situation and I relied heavily on my iPhone to keep in touch with what was happening in the world during breaks between being in the ward. As I am a political animal I of course wanted to keep abreast of what was happening on the political blogs. However I discovered in October 2011 that my Vodafone account was blocking access to Political Betting. This is one of my favourite sites which has incisive analysis on political trends and also often fascinating discussions in the comment threads from in the main highly informed people who often have a financial interest in their predictions. But I guess the fact that the site is linked with betting means that Vodafone considers it to be "mature content" (even though usually the posts are just political analysis and the betting side of it is often implicit). Anyway I called them up and asked for the block to be taken off. It took about 48 hours but they did so and I thought everything was from then on going to be OK. But a few months later, when we were in hospital again I suddenly found that Political Betting was blocked again. I was on the same contract and had made no request for the filter to be reapplied. I must admit I was quite annoyed and I called up in order to complain and to get the filter taken off again. I was somewhat surprised to find when I got through to the customer services that when I complained the chap I was speaking to took umbrage with me. He stated that Vodafone are under no obligation to take this filter off, they were not accountable for the filter being reapplied and that they were essentially doing me a favour by taking it off at all and I should be grateful, not complaining. I was pretty taken aback. I had been assertive in my complaint but not rude. I am always mindful in these situations that the call handler is not responsible for the policy but I felt I had every right to complain. I was paying £40+ per month for a smartphone internet service and they were blocking content that I had already told them I wanted. The call operator insisted on me apologising before we continued. Even though I felt my tone and comments had been fair, I did apologise and we moved on. After this he was friendly and efficient and did take the block off. As far as I know it has been off since. But what really stuck in my mind was not the argument about the tone of my complaint but the fact that the operator apparently following the policy of Vodafone was so insistent that to allow me full access to the internet was Vodafone doing me a favour! I found this very worrying. Why should a private company be deciding what I can and cannot read online when what I want to read is perfectly legal? It sounded to me like if they so decided they could reapply the filter, refuse to turn it off and I would have no recourse. If this is right then I think it shines a light on the approach of Vodafone and I suspect other telcos. They think allowing us access to things like betting sites, political satire, LGBT information and "adult content" of other types is a nice extra but not something they need to do. I think this is totally wrong and demonstrates to me why this idea of "opt out" services is so flawed. In my opinion anyone over the age of 18 should have full access to all legal content on the internet by default. They should not have to go crawling supplicant-like to their ISP to beg them to take the filter off and be told they are being done a favour. The only person who should be deciding if content is right for my eyes is me. This is the difference in income tax that people are paying in the current tax year versus what they paid under the last year of Labour government. When let's not forget they had had 13 years to align the tax rates in any way they wished with a large majority in parliament. 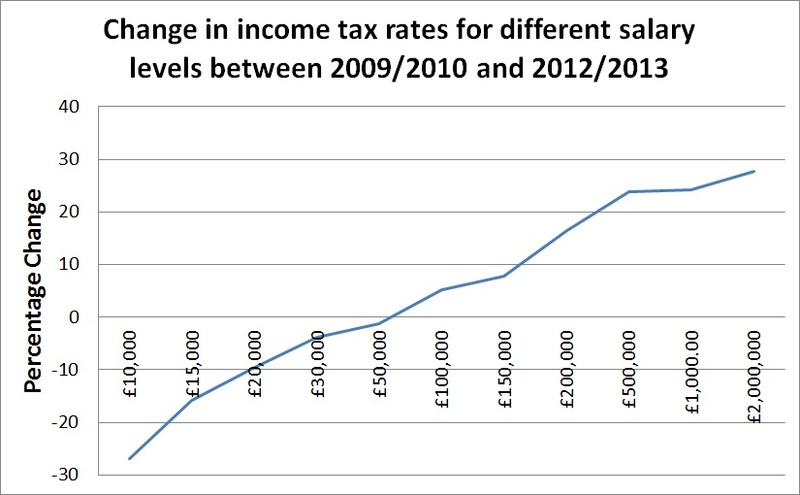 We can see that someone earning £10,000 is paying almost 30% less tax now whilst those earning the highest amounts (£500,000+) are paying well over 20% more. Oh, and that line above seems to me to be the dictionary definition of "progressive". It goes up progressively. Worth remembering this next time Labour are banging on about how unfair the coalition is being to the poorest people. Hattip to Len Gates and Carl Minns for the original data. The moment I saw Napster in the year 2000 I knew the game was up. It was just a matter of time. HMV has sadly had to call in the administrators. I feel very sorry for those who are going to lose their jobs. I have experienced redundancy myself and I know it can be very difficult, especially with the economy the way it is at the moment. 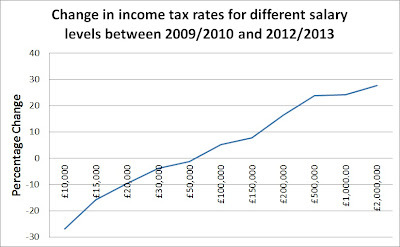 I have seen some, mainly left-wing activists try to blame "austerity" for this outcome. I'm afraid they are very wrong-headed about that. This day was inevitable. The idea that a business model to supply music, TV and films to the public that relies on physically creating the media, boxing it up, storing it in a warehouse, shipping it between depot locations and ultimately to a store, unloading and sorting the products onto the shelves, paying rent for city-centre locations, paying lots of staff to man/woman the stores and interact with the public and all the other costs associated with running an enterprise such as HMV could survive when the public can now purchase those things electronically and download them to a computer or set-top box immediately was unsustainable. It's nothing to do with austerity. To try and argue that HMV should have survived is the equivalent of 15th century people trying to shore up the position of the scribes as the printing press came of age. Unsustainable. Even though in 2000 Napster had a clunky interface, not that much variety and you needed to be quite technically savvy to use it combined with the very slow dial-up internet speeds making it impractical to download lots of music that didn't matter. I had seen that downloading music was possible. It was obvious that the infrastructure of things like iTunes and Spotify would come in time. It was also not much of a leap to see that Moore's law and the trajectory of increases in download speeds and storage capacity would soon make TV and films downloadable too. Napster in its original form was shut down soon after I first used it. But its successors both legitimate and less so have completely revolutionised the world of entertainment consumption in just 13 years. That was going to happen no matter how the economy was doing. You can't stop progress and we shouldn't want to stop it. We need to adjust to the new reality. Episode 43 of the House of Comments podcast "The One with the Onesie" was recorded on Sunday and is out today. This week myself and Emma Burnell are joined by Conservative activist and former PPC Charlotte Vere to discuss the government relaunch, childcare reform, Labour's proposals for regulating landlords and we all reveal whether or not any of us own a Onesie like Nick Clegg. There were some slight technical issues on the Skype call we used to record this it so occasionally the voices break up a bit although it gets better towards the end. Apologies for this. What's missing Ed is "Why"
Ed Miliband is beginning to make a habit of apologising for things that the previous Labour government did. That is a good thing. Too many politicians stick to their guns even when events (and eventually history) prove them wrong. To recognise that his own party has made mistakes and to outline what they were marks him out as a mature leader. The Opposition leader said the previous Labour government had become distant from the public on issues such as immigration, and failed to rein in excess at the top of society. Fleshing out his vision of One Nation Labour in a speech to the Fabian Society, he also highlighted new policies designed to help people priced out of buying homes. It is Miliband's latest attempt to distance himself from elements of the last government's record considered toxic by many strategists. New Labour was "too timid in enforcing rights and responsibilities, especially at the top, and it was too sanguine about the consequences of the rampant free markets". He said: "By the time we left office too many of people of Britain didn't feel as if the Labour party was open to their influence, or listening to them," Miliband said. I agree with Ed. Labour had become distant from the public on a whole raft of issues. They did fail to rein in excess at the top which given how equality is effectively Labour's rasion d'etre is somewhat bizarre. But while I commend his willingness to be honest about his party's failings there is something missing from his analysis. Why did Labour become distant from the public on so many issues? Why did they give free rein to the markets for so long and ignore all the calls from people both within politics (such as Vince Cable) and without? Why did they get so close to Rupert Murdoch and other newspaper proprietors? Why did they fail to crack down on rogue landlords? Etc. Etc. Etc. I'm not saying this in order to kick Ed and Labour. I am genuinely asking. I want to understand why it happened. Because unless we get a clear sense that there is an understanding of why Labour went so far off track on some of the key issues when they were in government then I am far from clear that it won't happen again. Government is tough. Very tough. My party has found this out the hard way in the last two and a half years. Tony Blair used to describe how several times per day he was essentially asked whether he wanted to "slash his wrists" or "cut his throat". I think the people that Ed Miliband is appealing to with his "One Nation" positioning will want to understand the reasons why what he is apologising for happened in the first place. When his party was found wanting in certain respects there must be causes. Structural? Personnel? Political? Probably a combination of all of these and more. But we are not getting this. Instead we are hearing that we need to "move on" from New Labour. Yes, we do. But before we move on we need to be clear on what caused the problems. Otherwise there is a very high risk that we will move back if Labour end up in government again. I get the sense that Ed really does not want this to happen. If so, his mea culpa needs a firmer basis. Episode 42 of the House of Comments podcast "The Shelf Stacking Reflex" was recorded on Sunday and is out today. This week myself and Emma Burnell cover Labour's work guarantee, the coalition's mid-term review and they give their own assessments of how the government and coalition has worked thus far. Also, Emma takes me to task on my reflex for conflating entry-level jobs with shelf stacking! I thought some of my London based readers might be interested in this event I'll be going to next Thursday evening organised by the redoubtable Soho Skeptics. It's a debate about the Leveson Report and its consequences featuring Nick Cohen, Suzanne Moore, Natalie Fenton and Evan Harris. I expect a high quality of debate and hopefully I'll get a chance to have my own rant from the floor. I usually do at these things! Bruce Forsyth will retire and hence will not be a main host on Strictly Come Dancing 2013 (although he may pop in to say hello). Despite rumours of a potential replacement, Ed Balls will still be Shadow Chancellor come the end of the year. Chris Huhne will return to the cabinet. Someone with a blog on the Lib Dem Blogs aggregator who has never been a parliamentarian will be enobled. The government will announce a timetable for the abolition of 1p and 2p coins. David Cameron will announce an in/out referendum on Europe to take place if the Conservatives win the next election. The Universal Credit will be delayed and eventually abandoned (this bit may happen next year) due to too many technical problems. IDS will resign when this finally happens. We will manage to get a government minister on as a guest on the House of Comments Podcast. One of either Mark Pack or Stephen Tall from off of Lib Dem Voice will appear on BBC's Question Time. For four years now I have predicted that Eddie Mair will become the main presenter of Question Time. But as Dimbleby_D still shows no signs of going anywhere any time soon I'm going to change this one. Mr Mair showed his mettle as a stand-in presenter on Newsnight during the Savile crisis so I now predict he will become a regular presenter on Newsnight when it is revamped this year. All around my hat I will wear the green willow, and all around my hat for a twelve month and a day. How did I do on my 2012 predictions? 1. HMV will go bust. WRONG. Should have chosen Comet! 2. A currently living former Chancellor of the Exchequer will no longer be with us by the end of the year. WRONG. They're all still alive and (as far as I know) in good health. 3. Barack Obama will win reelection with an even higher percentage of the vote than in 2008. CORRECT (sort of). OK, so it wasn't with a higher percentage than in 2008 but I'm giving myself half a point for this. 4. Chris Huhne will leave the cabinet. 5. David Laws will rejoin the cabinet. CORRECT (sort of). Technically he is not in the cabinet although he does have the right to "attend cabinet". But he is right back in the heart of the Lib Dem governmental operation so I'm giving myself half a point for this. 6. Kate from off of Teh Roayls will announce she is pregnant. The media will go loopy at the prospect. CORRECT. On both counts. She is pregnant and the media did indeed go loopy at the prospect. Although nobody could have predicted the tragic consequences for one of the ways in which a certain part of the media decided to cover her hospitalisation. 7. Mo Farah will win Gold at the Olympics. CORRECT! In fact he won two Golds! 8. Pointless will be promoted to prime time TV (i.e. after 7pm) with increased prizes to match. WRONG. Although it is going strong and rapidly becoming a stalwart of the schedules with regular celebrity specials on early Saturday evenings. 9. By the end of the year Yvette Cooper will be leader of the Labour Party. Couldn't really have been more WRONG. Ed Miliband had a wobble in 2011 but he is back firmly in control of his party now and I expect he will lead them into the next general election. 10. In a shock move I predict that Eddie Mair will become the new host of BBC Question Time. For the fourth year running. WRONG. Although he has certainly shown his mettle on the occasions he has stood in on Newsnight especially during their tribulations of recent weeks. So 3 spot ons, 2 sort ofs and 5 wrongs. About par for the course judging by previous years!